Want to ratchet down your pace and take it easy for a change? Well, we’ve found the perfect spot for you: La Grange de Mon Père, a delightful 4-star guest house, just outside the little village of Jouy-le-Potier, 24 km south of Orléans and a little over an hour from Paris. It’s no hassle to get there, so you’ll be able to relax even before you arrive! 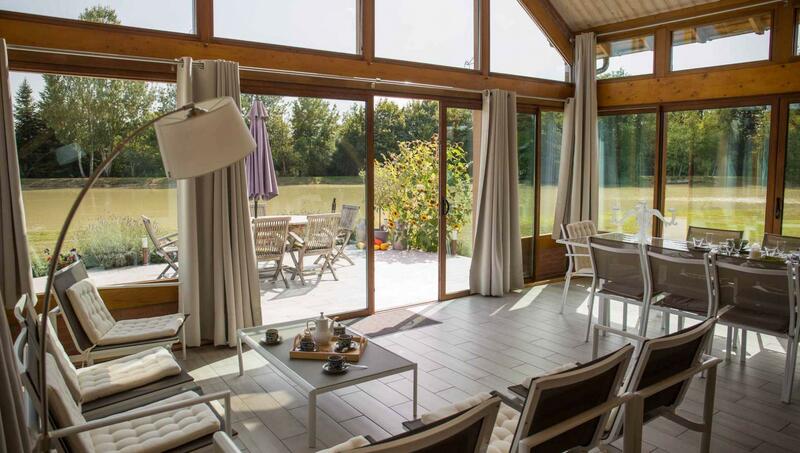 ‘La Grange’ is, in fact, a converted barn with its own small lake and lots to offer. A contemporary design with a fantastic open plan living space overlooking the gardens and lake; all modern and high-end amenities; a vast terrace where you can while away the long summer evenings or tarry over breakfast watching the birds take flight and the ducks glide past. With luck, you might even spot a deer or two! The guesthouse has a spacious, sunny 70 sq. m. living area with a fully equipped kitchen and wood stove which opens directly on to the terrace. The two large bedrooms that can sleep up to 6 people: a master suite with bathroom on the ground floor, and a large double bedroom above with wide bay windows to enjoy the fresh country air and restful view. Take a look at the video to see what’s in store for you! With its distinctly Zen-like flavour, La Grange de Mon Père is ideal for anyone looking for peace and quiet, but at the same time is a fine base for exploring the Loire Valley region. The owners, Jacqueline and Daniel Patrick, who speak English, live nearby and will greet you with gifts of flowers, fruit, and local honey, and occasionally drop by with some fresh garden vegetables. They’ll go all out to make you feel at home, and provide you with handy ‘insider’ tips about the best places to shop, dine and tours to take. The splendid Basilica of Cléry-St-André is less than 10 min. away. The Château de Chambord, the medieval town of Beaugency and the historic city of Orléans are all within easy reach, as is the Zoo-Park de Beauval and its baby panda. Take dip in the private lake or a ride in its little rowboat. Stroll or cycle along banks of the Loire. Just go with the flow – after all, that’s what you’re here for!